Last Friday, the United States Department of Justice joined a lawsuit against Wheeling Hospital. The story broke early in the day and the local TV stations carried the announcement on their evening newscasts. On Saturday, the Wheeling Intelligencer provided a short summary as well as the denials from a hospital PR release. Since then -- nothing. I have a hunch that I am not the only local citizen with many questions about this lawsuit. Yet, there has been no additional reporting. Nor will there likely be any until something major happens. The public be damned -- the news business is only about making money and thus it's much too expensive to pay a reporter to investigate and explain what this lawsuit means. The story is complex; it would require research and considerable amount of time to put together. Why bother when a fluff story (about dogs and/or kids) is so much easier and cheaper to do. When is the last time either of our two local TV channels investigated anything? I don't remember. Simply put, they also don't investigate -- let alone something connected to one of their cherished institutions, Wheeling Hospital. I'm afraid that this will get worse -- more cutbacks at Ogden Newspapers? These are things that are most important to me. More important than work. More important than sports. And in this day and age, keeping things in that kind of perspective can be rare. . . I feel our sports department is heading toward drastic changes in 2019, and I hope we are able to keep up the same valuable coverage of our area athletes that we are used to. I may be reading far too much into these words, but it looks to me like there will soon be major cutbacks in the sports department. I don’t have statistics, but my hunch is that local sports is one of the major reasons why a lot of readers buy newspapers. 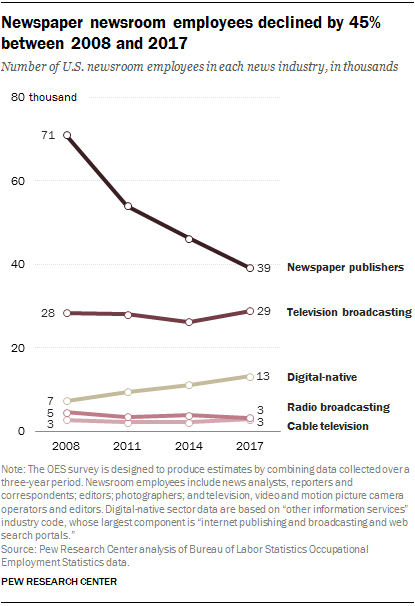 While a reader might have other resources for national and international news, local sports news is left to local newspapers and local TV stations. Will cutbacks in sports coverage further erode the subscriber base? The local Ogden papers have already cut back this year. Casey Junkins, who wrote about energy as well as serving as a local reporter, is now in New Hampshire serving as the city editor at another Ogden newspaper. It appears that he wasn’t replaced – his local reporting was covered by others and someone else was assigned to convert the local energy industry’s PR releases into news stories. And, as I’ve written on numerous occasions, the weekend editions of the Wheeling papers are filled with days-old (and sometimes weeks-old and months-old) articles and opinion pieces. Those weekend papers apparently get by with one reporter/editor and a sports editor. However, that sports editor may be soon gone. Ogden, however, is adapting to this by buying more newspapers. (See here and here.) In that regard, Ogden is not unlike Bob Murray, CEO of Murray Energy, who claims that you would have to be crazy to buy a coal mine right before he buys yet another coal mine. Ogden’s plan appears to consist of buying a small-town newspaper, laying off half the staff, and then doing a minimum of news coverage. Sadly, it doesn't keep the citizenry informed. Although I doubt that it matters to them.